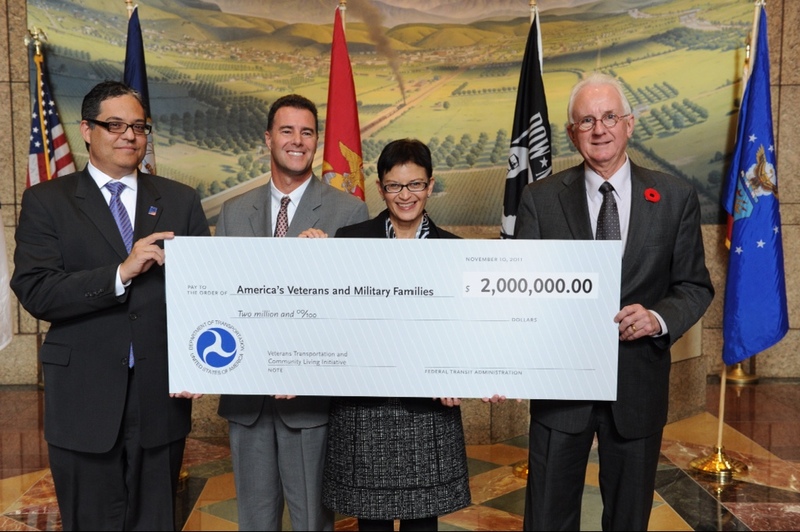 LOS ANGELES –Deputy Federal Transit Administrator Therese McMillan (in above photo with Metro officials) was in Los Angeles today to announce that two Southern California transit agencies will receive a total of $2.2 million as part of a $34.6 million program that will greatly enhance access to local, affordable transportation services for military families and spouses, and wounded warriors. Today’s announcement complements the Obama Administration’s Joining Forces initiative led by First Lady Michelle Obama and Dr. Jill Biden. This comprehensive, national effort is mobilizing all sectors of society to give our service members and their families’ critical opportunities and support. Los Angeles County Metropolitan Transportation Authority will receive $2 million to make it easier than ever for veterans, and others, to get up-to-the-minute traffic and travel information on Southern California’s 511 line using either a mobile phone or by going online. And Omnitrans, which serves San Bernardino’s sizable military community, will receive $227,240 to improve its 211 help-line, so that all the information about local transportation and other services is just a mouse click away. The $34.6 million was awarded to 55 projects in 32 states and Guam. A complete list of funded projects is available at http://fta.dot.gov/grants/13094.html. Today’s announcement supports President Obama’s Veterans Employment Initiative, an ongoing effort to win major private sector commitments to veteran and military spouse employment. To date, 96 companies have formed a public-private partnership with the Department of Defense to hire military spouses. And more than 25 individual companies have committed to veteran hiring or training targets, including, most recently, the American Logistics Association and its affiliates, which pledge to hire 25,000 veterans and spouses by the end of 2013. For more information visit: www.whitehouse.gov/joiningforces. Additional information on the Veterans Transportation and Community Living Initiative is available here.